Russian President Dmitry Medvedev dismissed suggestions on Wednesday during his Q&A session with the media that the release of Yukos CEO Mikhail Khodorkovsky would pose a threat to the community. Watch the media conference. Part 1. ­Watch the media conference. Part 2. ­­Watch the media conference. Part 3. The event was held at Russia’s "Silicon Valley," the Skolkovo technology hub that is situated on the outskirts of Moscow. It was Medvedev’s first media conference of such a large scale and the first time he had moderated a conference himself. During the event, which lasted for almost two-and-a-half hours, the head of state responded to about 90 questions from a field of over 800 journalists, including some 300 from abroad. One journalist questioned Medvedev on Khodorkovsky, the former Yukos CEO who is currently in prison. Medvedev dismissed the suggestion that the businessman would pose a "threat" to society upon his release from prison. “My answer will be short: there is absolutely no danger,” he said. In December, Khodorkovsky and his business partner, former Menatep head Platon Lebedev were sentenced to 13.5 years in prison each, in a second case against them. The two businessmen were found guilty of embezzling 218 million tonnes of oil from Yukos’ subsidiary companies and money laundering. 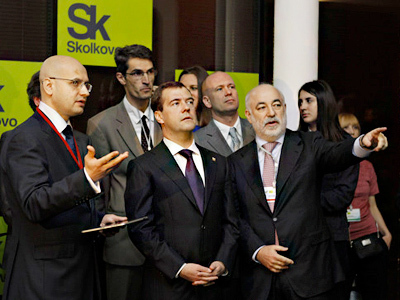 ­The first question at the Skolkovo conference dealt with Russia's development and modernization, first outlined by President Medvedev in his “Go, Russia!” article in August 2009. 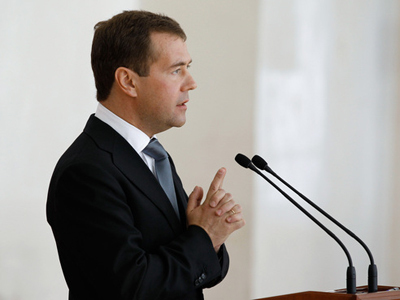 Medvedev noted some limited success in the ongoing modernization process, while admitting it could be more substantial. “Modernization is not a simple gradual movement, but a quality breakthrough,” the president said. The Russian leader said there were state initiatives covering all the directions outlined in his “Go, Russia!” article and the work on these programs is continuing. At the same time, Medvedev said that although the country has not achieved any significant breakthroughs, this does not mean that we should give up on modernization. In response to a question regarding the dismissal of the head of the upper house of the Russian Parliament, Sergey Mironov, Medvedev said that the situation must be used for the good of the present political system and for the improving democracy in general. “At some point state service ends for anyone, including the president,” Medvedev said in regards to Mironov’s recall from the upper house, the deliberations of which were taking place in the St. Petersburg parliament simultaneously with the president's press conference. “Mironov was working well, but he represents a political force and we all favor political competition,” the president said. He added that the situation represents a chance for Russia to see how political competition works. On the most anticipated questions of the session, President Medvedev said that the time was not appropriate to say whether or not he is going to run for the presidency in 2012. He said the time is not yet ripe to announce whether or not he will take part in the upcoming presidential race. "Such decisions must be made precisely at the moment when all prerequisites are ripe for that, when this will have the final political effect," Medvedev told the assembled journalists on Wednesday. He added that the venue was not appropriate for making such an announcement. "Precisely for this reason, while deciding on the announcement of such decisions, one should select a format somewhat different from a press conference, although this would look very spectacular and enticing," he said. The question as to whom will run in the presidential elections in 2012 has been a recurring one at every media event Medvedev and Putin are in attendance. The Russian leader went on to stress that “political life is not a show, but quite complicated work”. “We do this job to achieve our goals,” Medvedev said, adding that the leadership’s “big goal” is to raise standards of living in the country and make people’s lives better. Commenting on yet another popular question – his relations with Putin – Medvedev said that they are “more than a tandem; we are like-minded people.” He noted that they have known each other for over 20 years now and “understand each other well." “We really are like-minded people, we share similar approaches to key issues concerning the development of the country,” Medvedev said. However, that does not mean that their views always match and they should not, as that would be bad and “very boring”. He stressed that every person has the right to his or her own opinion, but in general, he and Putin are close in their strategies. Otherwise, he said, they would not be able to work together as political partners. 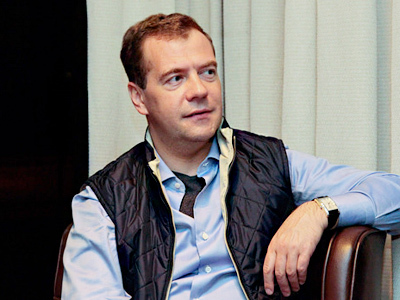 According to Medvedev, competition can either help in work or lead to a dead end. He expressed hope that the principle of responsibility for the country and its people will be considered when making a decision as to who will run for presidency and what will be done in the future. “When I said that I had close or the same positions as Prime Minister Putin, I meant the following. We really have a common education, we are both lawyers, the set of values we have are very close. We both want our country to be modern, effective. We want our people to have a decent life,” he said. This does not mean that our positions are absolutely the same on some minor issues, and I think this is good, he added. However, it is not all on minor questions their positions sometimes differ. The two leaders have different stances on modernization. “He [prime minister Putin] thinks that modernization is a gradual development and I think that we do have the resources to make a breakthrough,” the president said. Earlier in May, Medvedev said that he believed that Russian presidents in the future should belong to a political party. Commenting on the issue on Wednesday, he reiterated his stance. Medvedev said that if he decides to run for a second presidential term, he would like to have the support of political forces, including of those parties who nominated him for the post in 2008. He noted that there are not too many parties in Russia, which, in fact, is good. ­Journalists were also interested in Medvedev’s personal perception of the global situation and whether it has changed since he began his presidency. He replied that he has traveled extensively and this prevents him from seeing life through "rose-colored glasses." During his trips, he meets and talks with local people and through these conversations, among other things, he gets an objective picture of what is going on in the country. “I would like to be the first president to have visited every single region of Russia,” Medvedev confessed. As for the objectivity, he added that he not only gets information from official reports but he regularly searches the internet, including on Twitter, of which he is an active user. ­When asked for his view on Russia’s relations with NATO, Medvedev said that the relations were good, but they could be seriously damaged by the development of the US missile defense system in Eastern Europe. The president also warned that Russia could suspend or even end the recently signed “New START” treaty if the missile defense systems in Europe continue to develop. “The treaty contains a clause that in the case that the missile defense system continues to develop, this would mean the break of the nuclear parity and the treaty can be suspended or even declared void,” Medvedev said. President Medvedev said that Moscow would not support a resolution on Syria similar to those recently passed by the United Nations on Libya. “I would not support such a resolution even if my friends and fellows asked me to do so,” the president said, in response to a question from RT. As a wave of popular unrest continues to sweep through the Arabic countries, protesters in Syria are demanding the resignation of the republic’s President Bashar Assad. Earlier this year, the UN Security Council passed resolutions on Libya that were designed to protect civilians caught up in anti-government unrest. Russia abstained from voting on the UN resolution, though did not veto it. Commenting on the issue during the Skolkovo media conference, Medvedev said that Russia supported the resolutions on Libya, as the documents expressed the legitimate concerns of the global community. However, further development of events in Libya, where NATO appears to be exceeding its UN mandate, show that UN resolutions can be manipulated. Medvedev noted that Syrian President Bashar Assad must be given a chance to fulfill his reform promises and warned against foreign interference in the country. ­When asked about his future plans to develop the North Caucasus region, Medvedev said that the federal government would continue to allocate money to the Caucasus republics until they manage to build strong and competitive economies, calling any suggestions to cut the subsidies to North Caucasus region “short-sighted”. “Our country is strong in its unity,” the president said. He acknowledged that there are many problems in the region and added that unemployment was the main among them as it was the main root of extremism. Medvedev said the subsidies were a temporary measure, but stressed that they will continue until the Caucasus republics build their own strong and competitive economies, possibly with an emphasis on services, especially tourism. ­A journalist from the Chinese news agency Xinhua was interested in the prospects of Russia-China economic relations, especially given the fact that this summer the countries will mark the tenth anniversary of the treaty on a friendly relationship and bilateral co-operation. “We are at the peak of our relationship with China and I hope it will remain the same way in the next years and decades. For us, relations with China are not a short-term goal. We are strategic partners. We work together in the Shanghai Co-operation Organization and BRICS, we are trade partners. We agreed with Chinese President Hu Jintao that we will bring our trade turnover up to $100 billion,” he said. ­Speaking on Ukraine’s possible integration with the European Union and how it would affect the energy trade, Medvedev said that he fully supported the Ukrainian people’s freedom of choice, but stressed that the choice must be made between Europe and the Eurasian customs union. “If Ukraine chooses the European vector, then surely it will find it more difficult to find connections within the single economic space and the Customs Union in which Russia, Kazakhstan and Belarus are taking part, because it is a different union. One cannot be everywhere. All must understand this, including my Ukrainian colleagues,” Medvedev said. Ukraine cannot sit between two chairs, it must choose, he added. The Russian president also said that Russia was ready to consider the terms and contracts regulating the natural gas supplies to Ukraine, but stressed that there will be no new contracts before the old ones expire. He mentioned that Russia was not stubborn in the talks, but there were known economic principles that affected the price on natural gas. ­When a reporter from the Siberian republic of Sakha-Yakutiya asked the president if he considered it possible to bring back gubernatorial elections, Medvedev said that his personal attitude towards such elections has changed over the years and also said it was possible that the elections would be brought back in ten or 15 years. At the same time he stressed that presently the existing procedure of appointment of governors better suits the modern conditions. He also said that the changes in the political system needed prerequisites. The president reminded the audience that he was among the authors of the bill that canceled the gubernatorial elections and replaced them with a system of direct presidential appointment in 2004, and said that back then he was confident that such changes were absolutely necessary, as they prevented populists from coming to power. But he added that the process could be returned in the near future, as it allows the country to be governed in an effective way. ­The president could not escape a question concerning the circumstances surrounding the death of attorney Sergey Magnitsky of the Hermitage Capital investment fund who died while awaiting trial in prison. “We should look into it [the causes of Magnitsky’s death], why it happened. In this regard, investigation has significantly advanced. It was reported to me that very soon we’ll have the results of the investigation into the circumstances of his death and its causes,” Medvedev said. “It’s not that simple, it’s necessary to go into details and establish the circle of persons involved, both Russian and foreign,” he added. Medvedev also said that it is essential that investigation proceed quickly and the results be made public. ­Answering a question about the failed deal between Rosneft and BP, the president said that it should have been prepared more thoroughly. “They should have paid more attention to the legal issues of the deal which always come up when you prepare a major document of this kind,” he pointed out. “If the deal goes through I will be happy because this is a good deal for our country." In this regard, he stressed that a good investment climate is very important for Russia. ­Wrapping up the press conference, the president returned to the question about the achievements and problems the country confronted during his term. Medvedev said that the main success was that Russia managed to maintain a pattern of development in the most difficult situation of the decade – the global financial crisis. The president said that living conditions had not deteriorated and the country had recovered quickly. Medvedev acknowledged that Russia had not reached a breakthrough in raising living standards; many of its citizens are still living on the verge of or below the poverty level. He also said that though economic development was improving, it was progressing at too slow of a pace, with little diversification in the economy. The Russian leader also noted that Russia has not improved its investment climate. After naming all these problems, President Medvedev said that they were not an excuse for depression, but rather an agenda for the future. 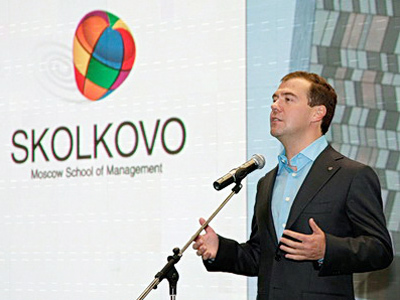 Medvedev's first Q&A session since he took office in 2008 took place at the Congress Hall of the Skolkovo Management School campus. Over 800 journalists – including 300 from abroad – attended the event that is also be broadcast live on several Russian TV channels, radio stations and on the internet. The Congress Hall seats 660 people, but there is another working zone with a 400-seat capacity open for journalists in the same campus building. Nicknamed “the disc”, the campus was designed by one of the world’s most prominent contemporary architects, Britain's David Adjaye. According to Medvedev's press-secretary Natalya Timakova, the choice of the venue for the news conference was not accidental, as a great number of regional and foreign media expressed interest in the event. “We are confident that they will have a keen interest to take a look at the Skolkovo project and to see for themselves how it is being implemented,” she said, as cited by Itrar-Tass. The spokeswoman noted that the innovation center is a modern and interesting site, which has all technical capabilities for holding top-level events. All the reporters accredited for the conference received ID numbers via e-mail, using which they could submit their questions to the Russian President. “Medvedev will look through all questions, select the most interesting ones and will give a chance to ask them,” Timakova said earlier. 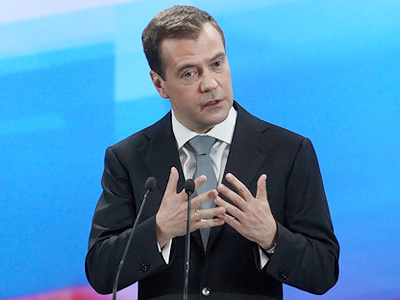 In addition, media representatives will be able to address Medvedev right at the conference. The event was simultaneously translated to English, French, German and Japanese. On September 21, 2006, then-President Vladimir Putin laid the ceremonial first stone of the future Skolkovo Campus building, and four years on, in 2010, the US$250-million construction work was completed. 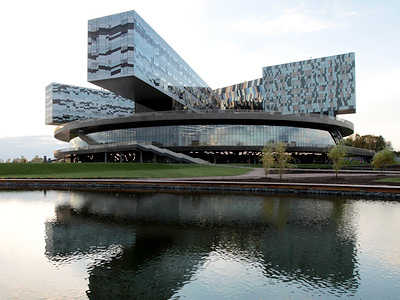 The Skolkovo innovation center has become one of Russia's most ambitious projects, a symbol of modernization of the country's economy. According to Medvedev, the tech-hub should become “an ideology running through the life of our society which would also be clear to both mature and young people.” At the same time, the president stressed that Russia's “Silicon Valley” should help to promote innovative developments in the rest of the state rather than remain an “innovation paradise” on a separate territory.